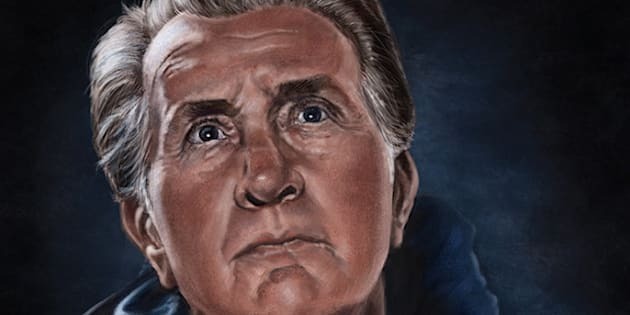 When Alberta artist Patrick LaMontagne painted a portrait of Martin Sheen and shared it on his social media account, he did not expect his work to find its way to Sheen himself. But when Sheen's son Emilio Estevez, who was tagged in LaMontagne's mention on Twitter, saw the painting of his father's character from the movie 'The Way' he reached out to LaMontagne immediately. Estevez asked LaMontagne for a print of the painting, one he could give his dad for Christmas, the Canmore painter recalled. "The image is gorgeous and you've captured my father in a way that few have," said Estevez in his initial e-mail to LaMontagne. The digital painter said he was skeptical as first. "I was wondering which one of my friends was playing a joke on me," he says. He said he decided to have faith in the words he read and wrote back. Being too close to Christmas and wanting to perfect the portrait before sending a print to Estevez, LaMontagne said he finally sent the portrait to the actor in January. The actors received the painting on Friday. Sheen was thrilled and delighted, Estevez told LaMontagne. Inspired by the movie 'The Way,' LaMontagne said he painted a portrait of Sheen's character to take a break from commercial work. LaMontagne said he was inspired by the closed off character portrayed by Sheen in the film, a character who grows, throughout the movie, and gradually opens up to realize he is part of a larger community. The artist did not take payment for the portrait, saying it would have tainted the whole experience. "My gut instinct said 'if you sell it you ruin what you got back,'" which was enjoying painting again. LaMontagne said he won't try to duplicate the experience but will continue to paint characters who inspire him. Estevez also took to Twitter to thank LaMontagne, saying "Thank you Patrick. Wonderful painting. Wonderful story. Martin was thrilled."